About half a century ago Indus Civilization (2600-1900 BCE) was known to the world mostly through Moen jo Daro and Harappa, the two largest ancient sites in Pakistan. The Civilization, however, was spread over an area of about a million square kilometers with hundreds of buried sites, hence 1500 more have been discovered since then and out of these 1000 are in India. This is because India had launched an extensive exploration program soon after the Partition. One of the main architects to lay the foundations of post-Partition archaeology policy was Maulana Abul Kalam Azad. For those who are curious to see how far a maulana can go in a secular field I must inform that Azad was not a maulana in the mullah sense. He was a scholar of Islam, an astute statesman, a dedicated writer and a freedom fighter. He stood against the British colonial rule but he was not in favor of Partition as he believed in Hindu Muslim unity and endorsed secularism. Incidentally, yesterday November 11, when I was writing this blog India was celebrating his 125th birth anniversary. Maulana was the first Minister of Education of the independent India and he remained on this post until his death in 1958. In this capacity he may have spoken on various aspects of archaeology on many occasions, my attention was drawn to one of the speech he delivered while presiding over the 6th meeting of the Central Advisory Board of Archaeology on July 2, 1949. He began with the tremendous work done on the Egyptian and Mesopotamian archaeology and gave credit to the Biblical references which helped the archaeologists in locating the ancient sites and in the reconstruction of their past. Most of us know that Indus Civilization is deprived of such references, even the Vedas, the ancient most texts do not make any reference to a lost Civilization that once flourished on Sapta Sindhu, the Land of the Seven Rivers, as mentioned in the Rig Veda. The land now has five rivers as Saraswati and Drishadwati had changed courses long ago. Maulana Azad also acknowledged the great work of British and other archaeologists that had gone in the excavations of the monumental structures scattered around the Nile, Euphrates and Tigris and he compared it with the work done on the Indian soil. He also gave a good account of the ‘checkered history of the department of archaeology’ which at one point was almost abolished and was saved only by the intervention of George Nathaniel Curzon, Viceroy of India (1899-1905). Curzon is mostly remembered for his notorious Partition of Bengal but Maulana reminded the audience of his role- promoting research and preservation of archaeological and historical monuments- which the viceroy considered to be his ‘imperial obligation.’ Curzon also centralized the administration of archaeology and appointed a young John Hubert Marshall as the Director General of Archaeological Survey of India (1902-1931). Marshall describes the impoverished state of archaeology. “I entered upon my office as Director General on the 22nd February, 1902…previous to my appointment the office of the director general had been in abeyance since the retirement of Dr. Burgess in 1889, in which year the Government of India decided, on grounds of financial economy, to limit the Archaeological staff to a government epigraphist and three provincial surveyors-for Madras, Bombay and the United Provinces- with the addition of an architectural assistant for the last named circle.” Beginning with four staff members, two decades later Marshall was to hire 1100 laborers to excavate the site of Moen jo Daro which turned out to be the most spectacular archaeological discovery of British India. After Partition while Maulana emphasized to ‘utilize the resources of archaeology to discover ancient history’ he also recommended work in Jaiselmer and Bikaner as these were connected to Indus Valley Civilization. This was the beginning of the exploration campaign that unearthed hundreds of Indus sites. Prominent among these are Kali Bangan (near Delhi) Lothal (Gujarat), Dholavira (Kuch) . Far from River Indus the other two fertile areas of the Civilization, so far discovered, are the coastal strip of Gujarat, Kathiawar and Kutch and the River Ghaggar-Hakra region divided between India and Pakistan. Ghaggar-Hakra was abandoned in 1900 BCE, its abandoned course in Pakistan is known as Hakra while its part in India is called Ghaggar. The lost river has been identified with the sacred Vedic river Saraswati which ran parallel to Indus. Exploration and excavations in these areas were initiated while Maulana was in the midterm of his office. Through the years discoveries, big and small were made in various forms. Lothal, a trading post on the Gulf of Cambay, revealed a dockyard which is considered to be the largest baked-brick structure of Indus Civilization while Haryana in the Ghaggar Basin exposed a significant number of sites. During the excavations of 2007-8 Farmana, the second largest site in Haryana, amongst other objects, also revealed a seal of Early Harappa period. Mention must be made here of Rafique Moghul who in 1970s explored 144 Indus sites in the Hakra region in Pakistan. After a long gap some significant work has been resumed in Derawar Fort in Cholistan. This was being done by the Department of Archaeology, Punjab University. Incidentally a seal too has been discovered from the recent work. But what’s in a seal or two? The discourse on these two seals will require another blog. Coming back to Maulana he had a well-rounded approach as he also recommended popularization of archaeology and suggested few measures such as the printing of archaeology related post cards and albums and even producing films on archaeology. Ideas evolve; India made documentaries and several films on the theme of archaeology, in 1965 ‘Guide’ a novel written by the well-known R.K Narayan was finally made in a feature film, its English version was written by the Nobel laureate Pearl Buck, the film promoted archaeology not only in India but in the western world. 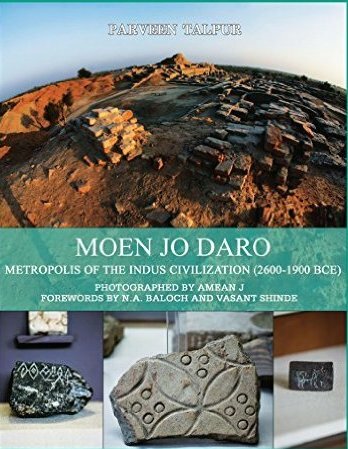 Download my latest book “Moenjodaro: Metropolis of the Indus Civilization (2600-1900 BCE)” on your iPad, iPhone, Kindle, Nook and e-reader.